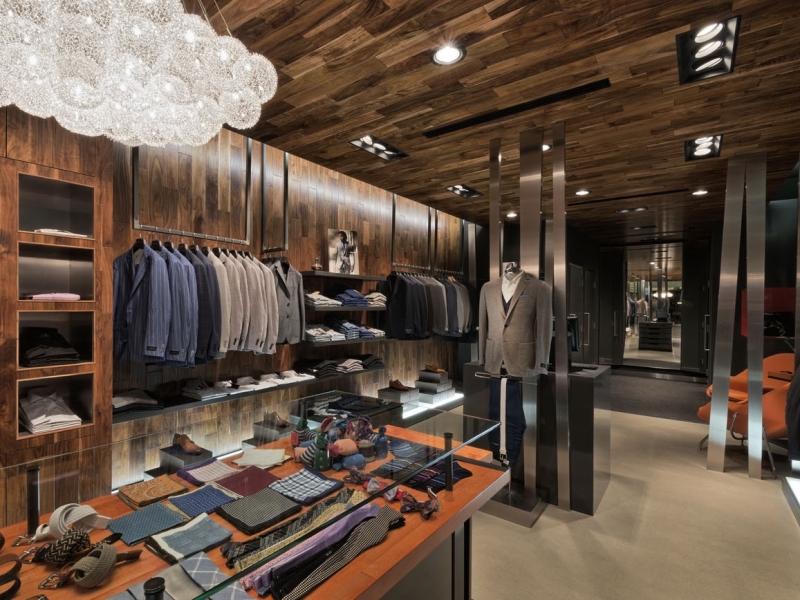 Inspired from the British bespoke tradition of men’s custom-made garments, the concept celebrates the notion of refined tailoring within a private cigar lounge setting. One of the core objectives was to attract a younger professional clientele, yet retain the aura of the bespoke ateliers. Evoking the bespoke model of fully personalized service, customers are encouraged to enjoy an espresso or cappuccino at the espresso station located between the main sales area and the fitting rooms where transactions are finalized. The space is treated like a cigar box with two inverted “L’s” on two planes. This treatment creates visual interest in the long and very narrow space, at only 15 feet wide. There is no cash counter in the store as the bespoke tradition holds that transactions are discreet and handled in low-key personal manner.